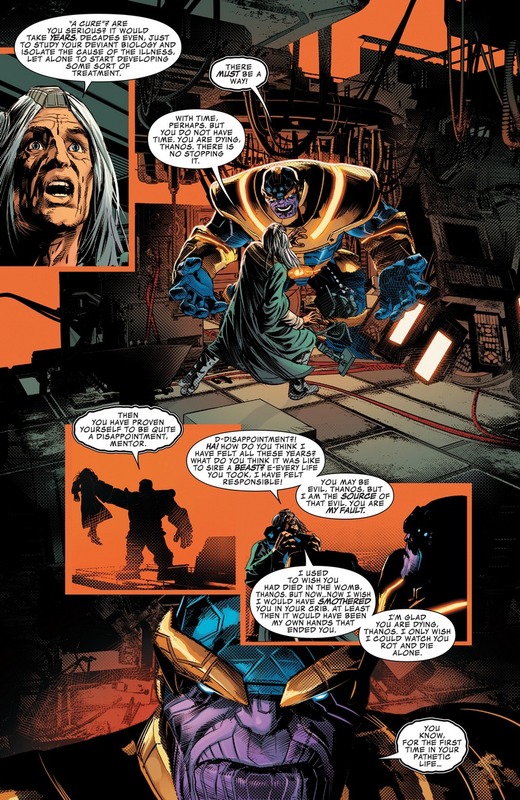 We’re doing Thanos # 2 spoilers and in this issue (written by Jeff Lemire and art by Mike Deodato) we find out that Thanos has actually some kind of God-cancer. 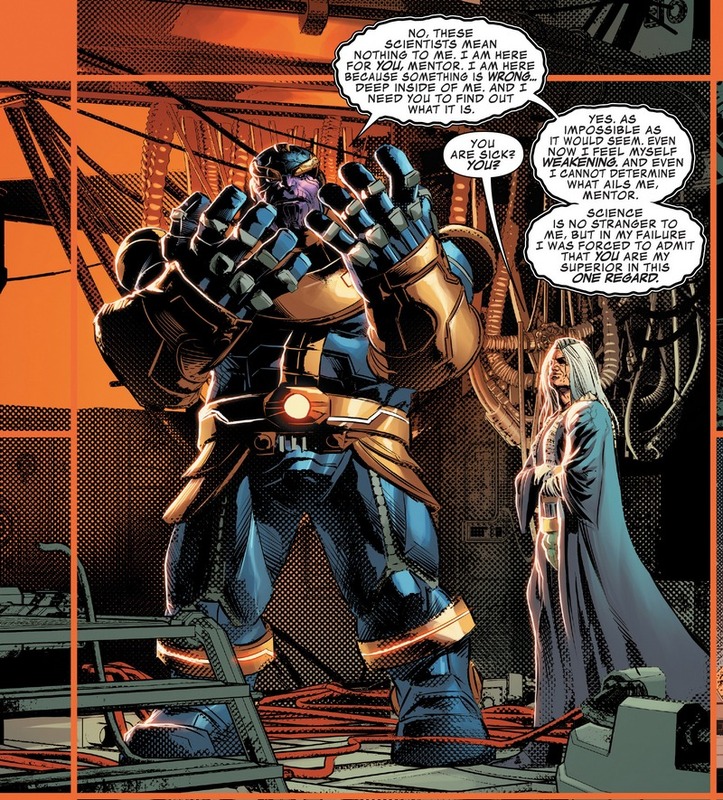 The first issue ended with the reveal that Thanos was sick and that this was the proper time to attack the Mad Titan, which was the subplot we see with Thane and what appears to be Mistress Death. 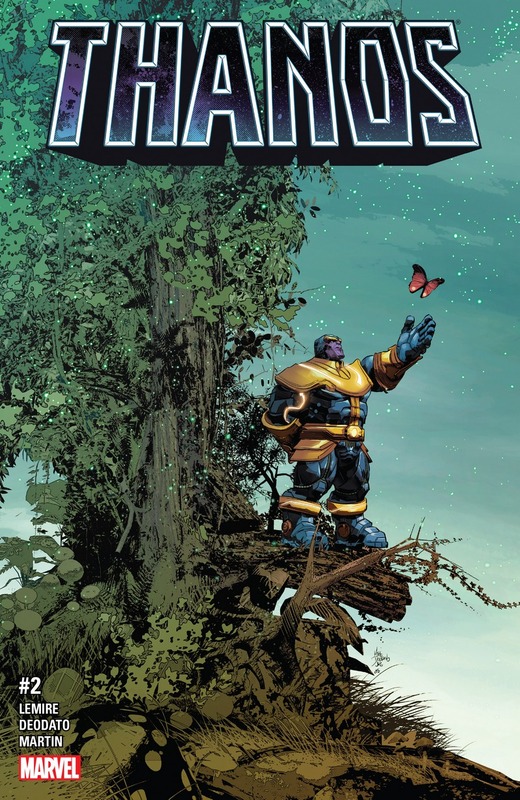 In this issue, we begin with the reveal that Thanos IS actively looking for a cure for his condition. He raids a planet full of healers and kills every last one of them when they cannot cure him. 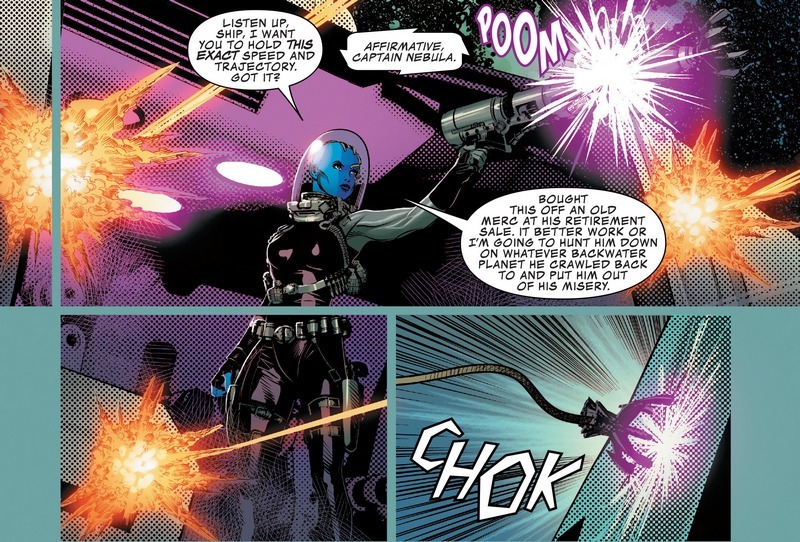 In another part of space we find out that Nebula now looks like the MCU version of the character and that she’s mostly stuck doing space pirate-y things. This time she’s stealing from rival pirates to deliver the goods to the Collector (which may or may not look like Benicio Del Toro now). 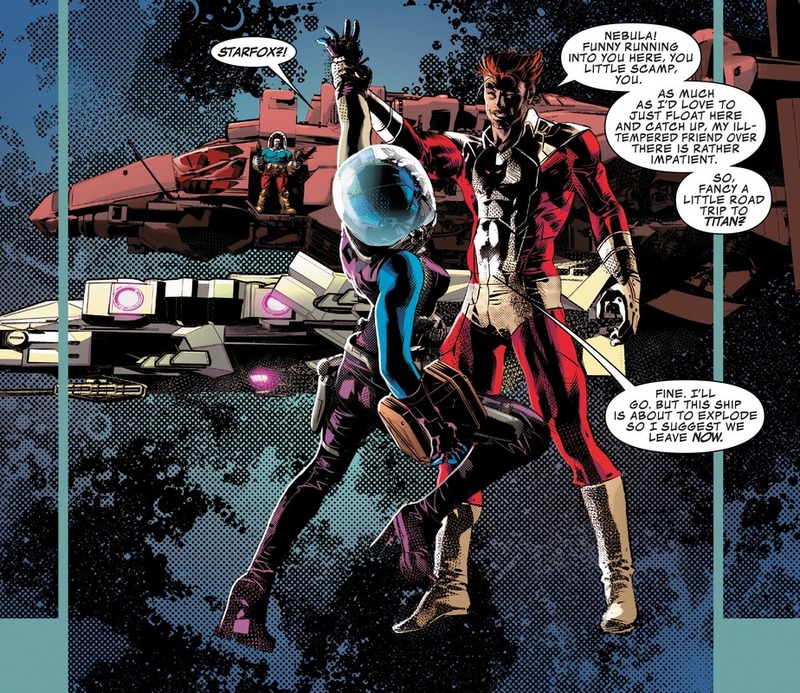 In the middle of her heist, she bumps into the pair of Eros aka Starfox and Tryco the Champion. Both of whom are actively looking to pull her into this mysterious meeting. 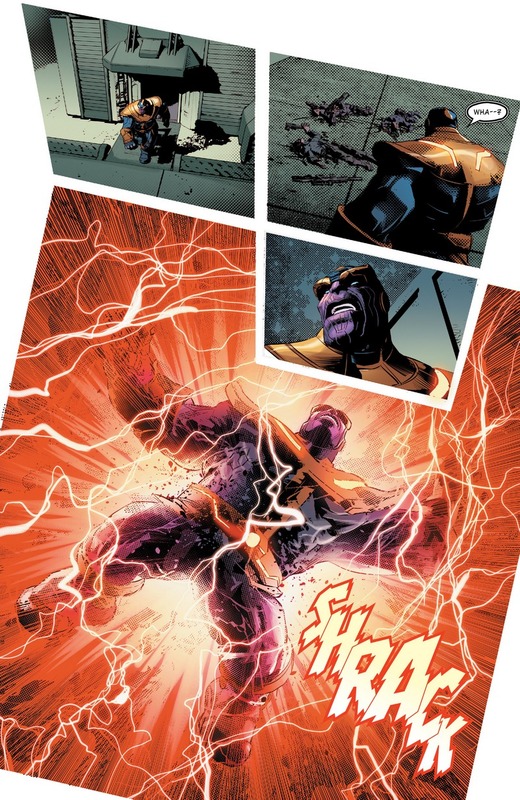 Meanwhile, In a Shiar controlled planet, Thanos touches down and begins his assault on what looks to be the main building. 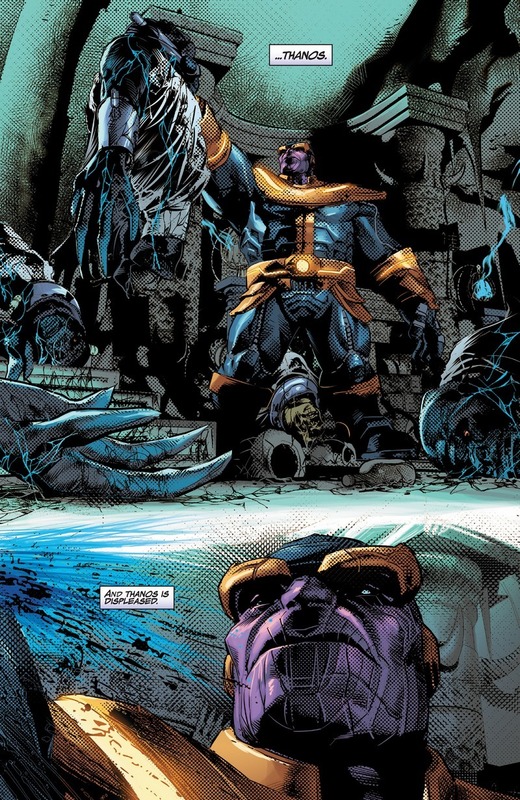 It’s there that Thanos finds his long-lost father, Mentor. The same man he hates the most. 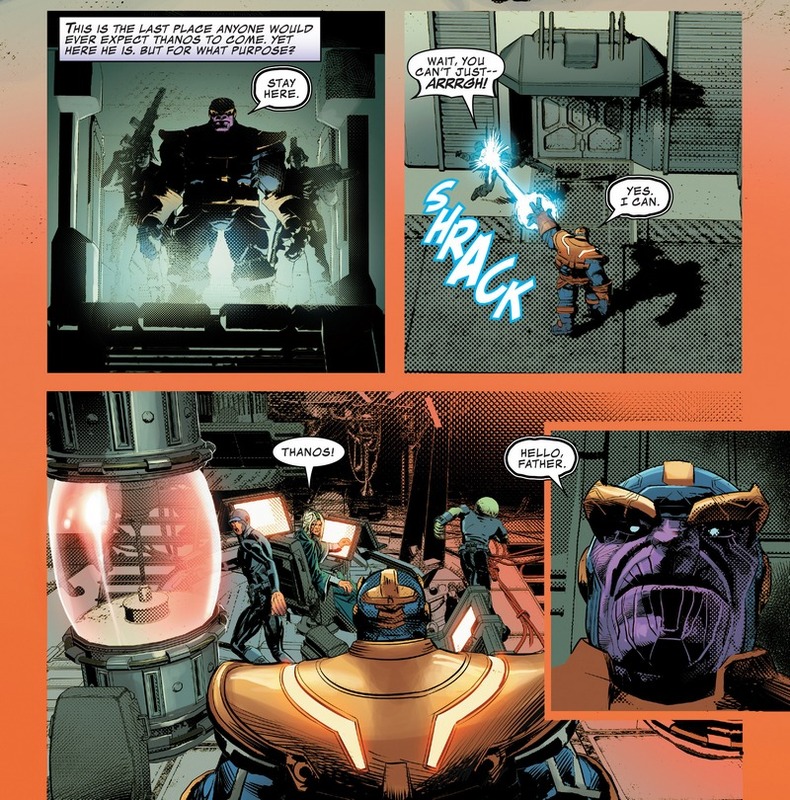 During their discussion, Thanos forces his father to help him find a cure for his illness. Knowing that the fate of the people in colony rests on his hands, Mentor decides to play nice with his deviant son. 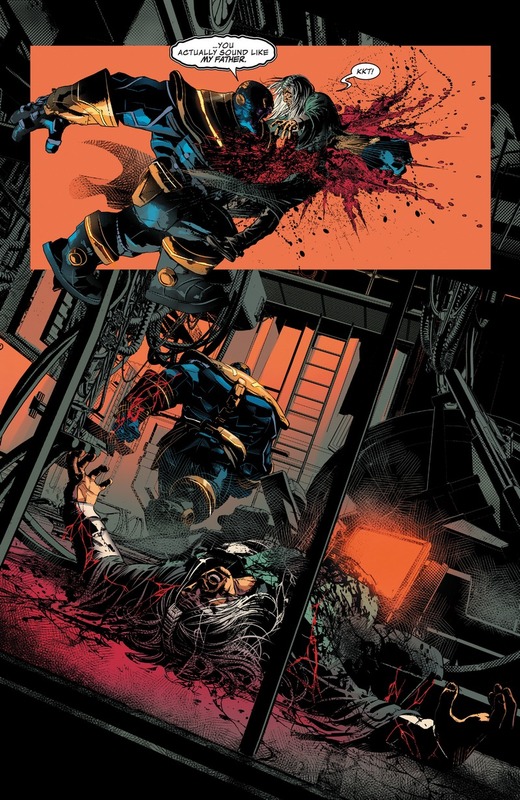 We also learn that Thanos has weeks to live and the cure won’t be available for years because according to Mentor, they need to study his physiology so the tl;dr answer is that he’s screwed. 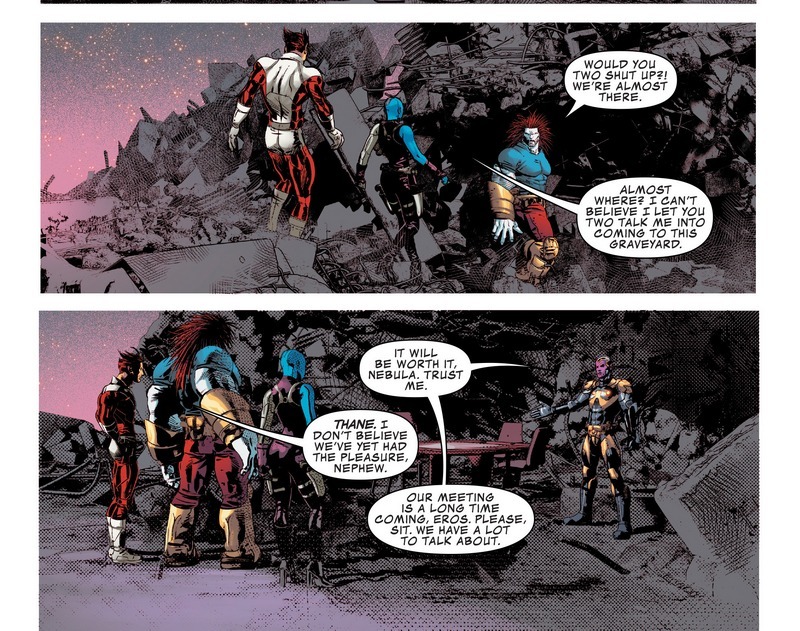 Back with Starfox within the issue, they finally meetup with their host who happens to be his nephew and Thanos’ son Thane. 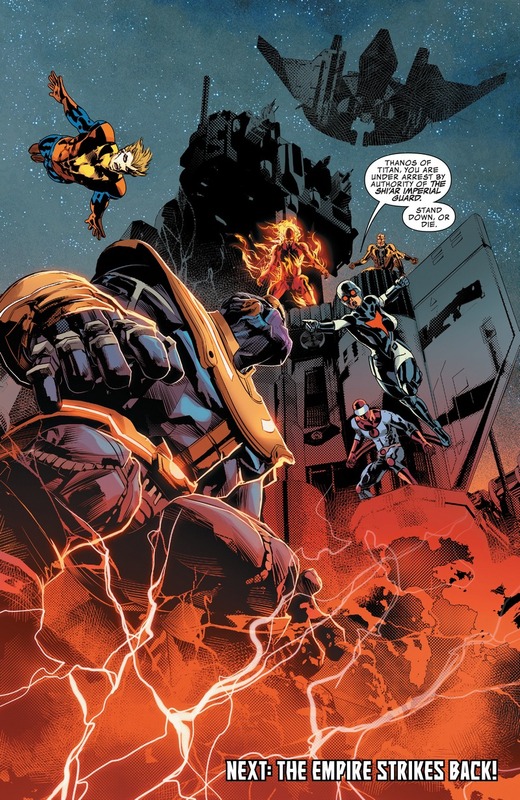 Thane gives them the low down on the plan and provided they are actually going to be part of this, he tells them the first thing they would need to assure success..
Back with Thanos, the mad titan is pissed with what he learned and that his dad won’t help him. So he does what he does best. Lash out. 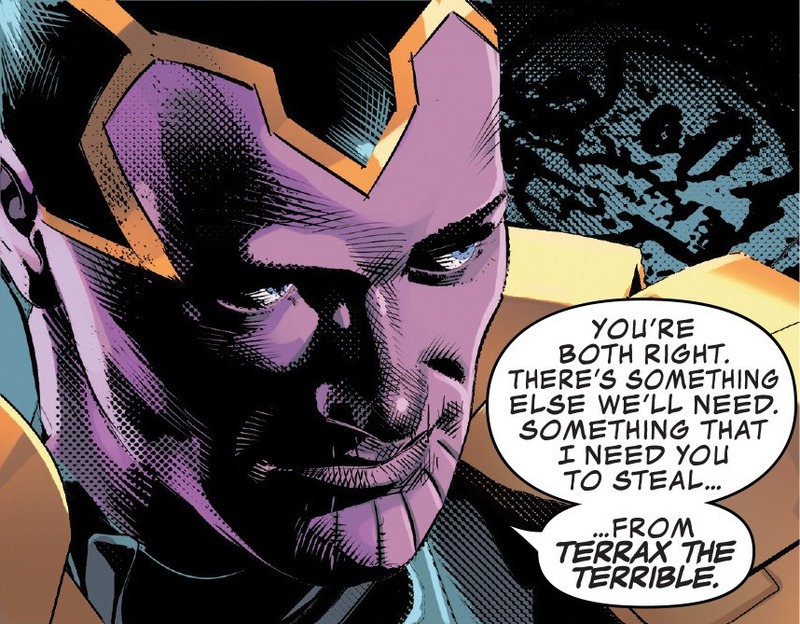 Goddamn Thanos just killed his old man with one punch. One punch! Leaving the complex, he gets a surprise attack. We learn that somebody managed to call the Shiar and that Gladiator has sent out his Royal Guard which may or may not be led by former Avenger member (and Cannonball’s wife) Smasher. Oh god please don’t kill Smasher Jeff Lemire. Also ballsy move to title the next issue “The Empire Strikes Back”. Ballsy.